The Baobab Cultural Center promotes a deeper understanding of African culture, as rooted in ancient traditions and routed by the migratory experiences of people through the Caribbean, Europe, and Asia to the Americas. 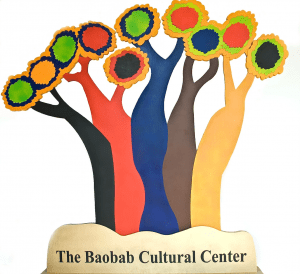 The Baobab was founded in 2005 by Dr. Moka Lantum, from Cameroon, and his wife, Dr. Cheryl Kodjo after they decided to open a gallery to share their growing African art collection with the community. The couple soon realized, though, that they had to do more than just showcase their treasures, so they further engaged the community through educational exhibits, films and documentaries, poetry readings, book discussions, and other cultural activities. The name, Baobab, refers to a sacred tree indigenous to the African continent and traditionally used as a meeting place to discuss important issues of the village. The center’s main focus is to foster community and build social capital, capturing the essence of African culture, Africa, and the diaspora. In partnership with the West Irondequoit School District and the Rochester City School District Societal Studies, the Baobab Cultural Center presents the Social Discovery Lab Series. This is a professional learning program developed to analyze the creation, recognition, affirmations, and expressions of black identity through artistic and historical works. Want to attend one of these sessions? Wed, April 3, 2019– Religion and Fraternities and the Shaping of Black Identity, Reliance, and Rhetoric; Presented by Dr. Joshua Dubler, U. of R.
Fri, April 19, 2019– Black Identity in History and Literature. What story do we tell? Teachers will analyze the impact of historical and social forces on Black Identity through analysis of literature. Presented by Dr. Jeffrey Tucker, U. of R.
To learn more information about the Social Discovery Lab Series or any other events or classes at the Baobab Cultural Center, visit their website at https://www.baobabcultural.org/ or call (585) 563-2145.